Uglyworld #986 - Helperings At Homes (Project BIG - Image 50-365), originally uploaded by www.bazpics.com. As you already knows we soons will moves house to a new place where we all stays togethers, and by alls I means alls of us uglies that stays with Baz and then alls of the others who stays with Mireille, it is goings to be super cools. As we has onlies a little mores than a month until the bigs day and Baz havings to work aways from home all weeks it means we must makes full uses of the times we has homes at the weekenders at the moment. With this in minds I decideds to puts on my awesomes Elf hat that I was wearings during lasts christmas when I was helpings out Santa at his secrets headquarters in the Norths Pole, and most importantlies to rolls my sleeves up and helps Baz out with all of the works which needs to be done before we moves. Baz started works on the bedroomer today and I offereds to gets stuck into the kitchens where I was secretlies hoping to finds lots of hiddens cookies while no-one was watchings, but unfortunatlies I didn't finds any hidings in any places at alls. I then starteds to go throughs all of the foods and stuffs they has in cupboards and checks all the daters to see if they will still be goods enougher to eats or drinks in the new houser. 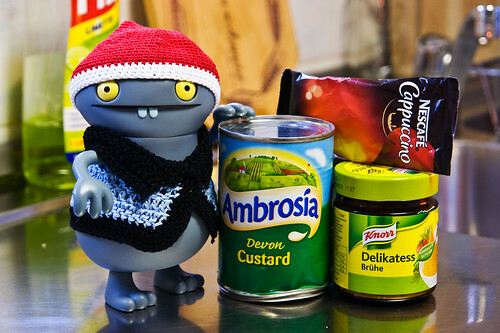 I was a littles sad to finds the Custards that you can sees here, as I lovers the stuffs but as we has been aways so much we didn't notices that we hads to eats it befores the ends of January, which is a shames!!! I also finded some others stuff that neededs to goes to the binner too, Wage decideds that we should refers to outs of date Cappuccino as "Crapuccino", whats you thinks, will it catches on? Anyways, I betters go and continues with alls the works which needers to be dones, I hopes you is all havings a goods weekender!! !